A circulator pump is a specific type of pump used to circulate gases, liquids, or slurries in a closed circuit. They are commonly found circulating water in a hydronic heating or cooling system. Because they only circulate liquid within a closed circuit, they only need to overcome the friction of a piping system (as opposed to lifting a fluid from a point of lower potential energy to a point of higher potential energy). Circulator pumps as used in hydronic systems are usually electrically powered centrifugal pumps. 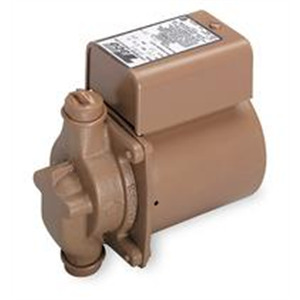 As used in homes, they are often small, sealed, and rated at a fraction of a horsepower, but in commercial applications they range in size up to many horsepower and the electric motor is usually separated from the pump body by some form of mechanical coupling. The sealed units used in home applications often have the motor rotor, pump impeller, and support bearings combined and sealed within the water circuit. This avoids one of the principal challenges faced by the larger, two-part pumps: maintaining a water-tight seal at the point where the pump drive shaft enters the pump body. Small- to medium-sized circulator pumps are usually supported entirely by the pipe flanges that join them to the rest of the hydronic plumbing. Large pumps are usually pad-mounted. Pumps that are used solely for closed hydronic systems can be made with cast iron components as the water in the loop will either become de-oxygenated or be treated with chemicals to inhibit corrosion. But pumps that have a steady stream of oxygenated, potable water flowing through them must be made of more expensive materials such as bronze.